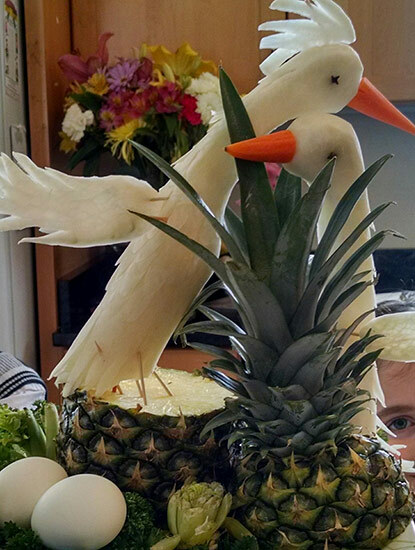 There are probably as many ways to make carved vegetable birds as there are people who like to carve fruits and vegetables. In this article, I’ll show you a whole bunch of different style of carved birds. Some are elaborate and gorgeous, created by skilled carvers, while others are whimsical and easy for anyone to make. This peacock type bird with cascading tail feathers was carved from Diakon, carrots and beets. 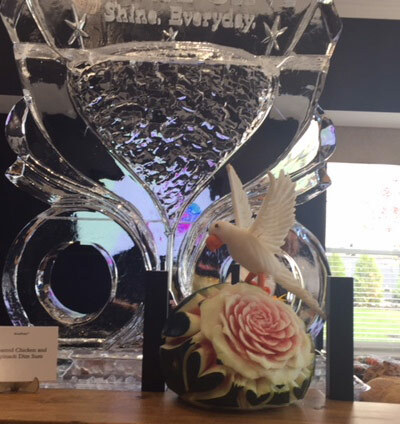 Customer of our lessons, Susan Belden Lombardo made this beautiful display for the Grand Opening of Story Point senior living facility. Hi Nita. Thank you for bring such a wonderful teacher! Here is a better look at the cascading tail feathers of Susan’s beautiful bird. 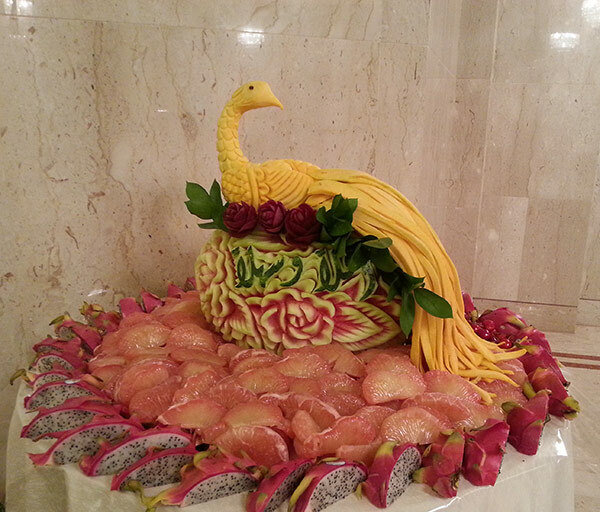 Pro carver Aneta Lekas’ gorgeous carved fruit and vegetable display features a peacock type bird carved from diakon. My favorite events are weddings. 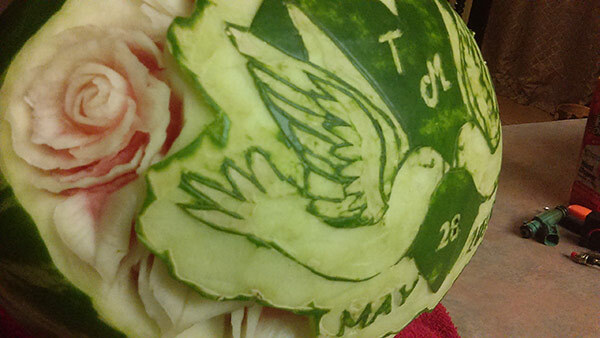 Customer/student Kate Kierat carved this peacock type bird into a watermelon. 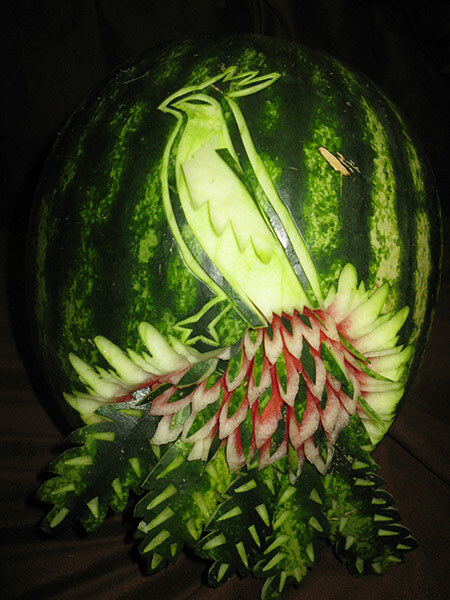 She extended the tail feathers by attaching additional ‘feathers’ carved from the watermelon rind. 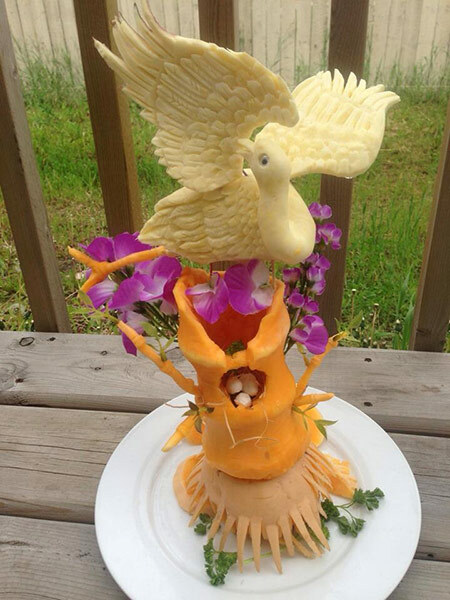 Customer (and former student of our lessons) Yolanda Diaz is now a professional carver. 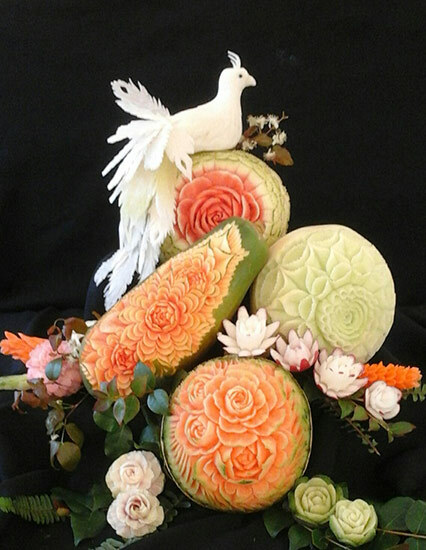 She carved these beautiful melons and topped her display with a fancy bird carved from diakon. This lovely bird with long tail feathers was carved by customer /student turned pro, Saada Al-Taie, in the Sultanate of Oman. Kabocha squash, which is sometimes known at Japanese pumpkin, is great for carving these types of birds. If you are not familiar with Kabocha squash, watch the video on my blog here. Here is a closer look at Saada’s carved vegetable bird. Each long tail feather can be attached with toothpicks or pins. 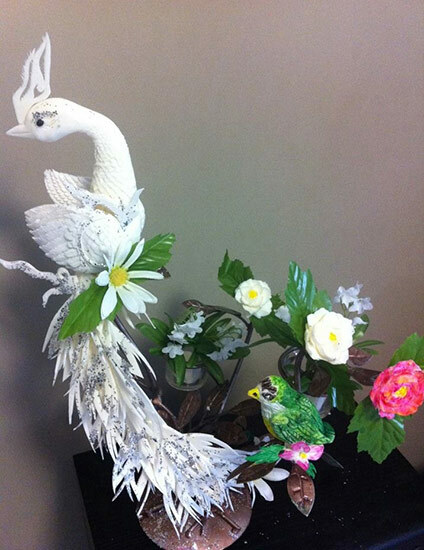 This gracefully shaped and intricately carved bird with spread wings was also carved by Dale Urnos. Look at the detail in the carving of the feathers. a purchased googly eye is used for it’s eye. This carved vegetable bird that looks like it’s about to take off in flight was created by Susie Lombardo. 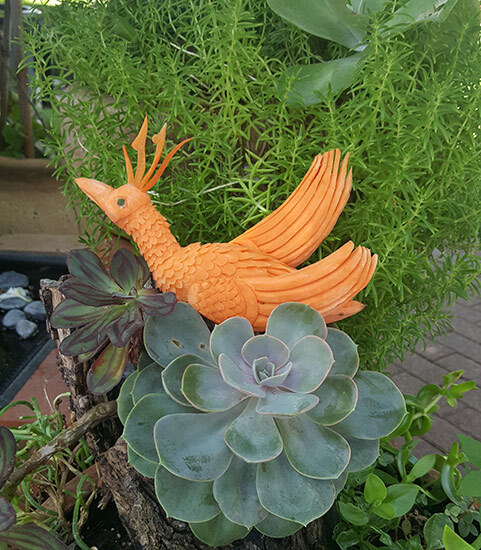 This bird that appears to have been carved from Kabocha squash or butternut squash by customer/ student Helen Ashuntantang. 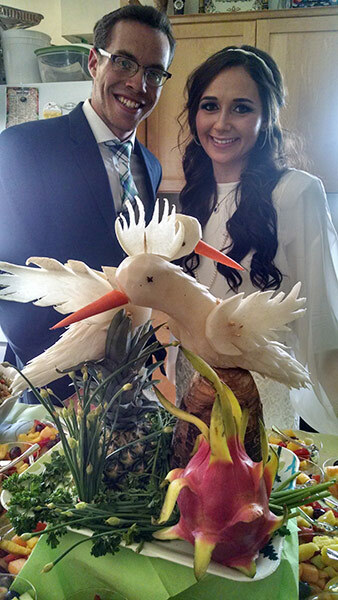 Moe Rosensaft carved these daikon birds and arranged them as love birds for a wedding. Here is a closer look at Moe’s love birds from a different angle. 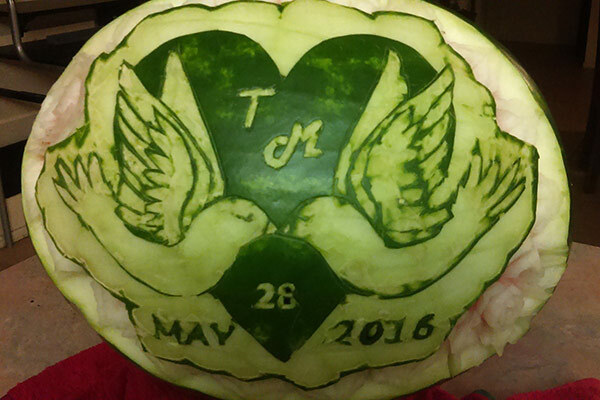 customer / student Janette-Cancel carved these love birds into a watermelon to celebrate a wedding. 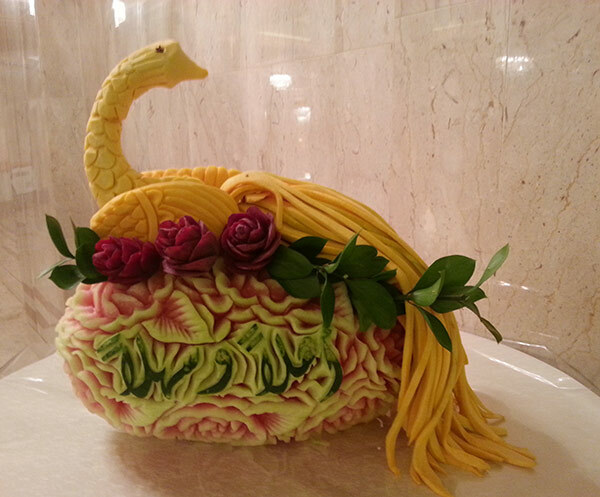 You can see how Janette carved roses and leaves around the love bird design. 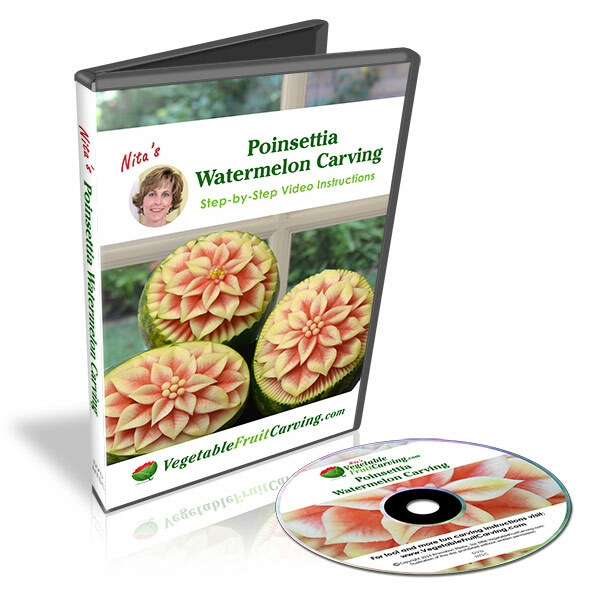 You can learn to carve watermelon roses in my video lessons, Carving Watermelons Roses, Buds and Leaves. 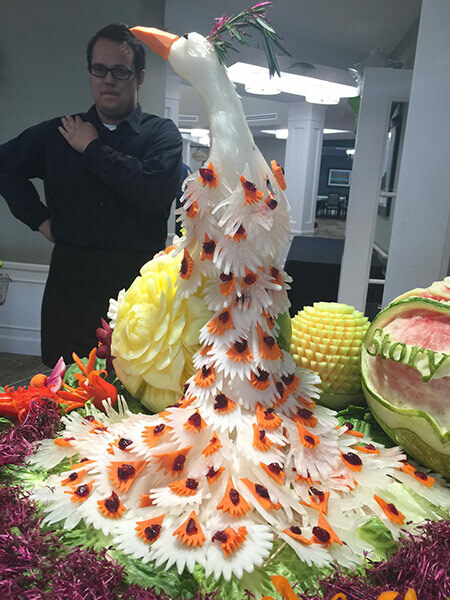 Ernesto Alvarez who had carved for top government organizations at the White House carved a flock of small carrot birds to top this watermelon carving. When adding eyes to carved vegetable birds, you can use glass eyes that come on wires. 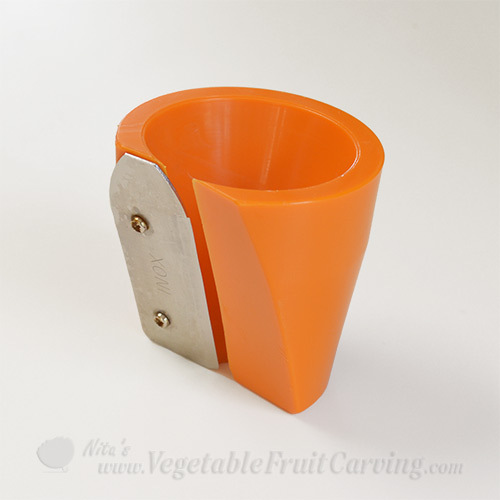 They are ready to stick right into your vegetable carving. Realistic looking glass eyes can be found in many sizes online. However, simple household items can make great eyes for birds, too. Try using pins with round heads, tiny thumbtacks with round heads, or even spices like whole cloves and whole pepper corns. round bits of vegetable skins and fruit peels can be used for simple eyes as you’ll see in the examples below. This adorable tangerine bird was made by Sherine Moustafa. 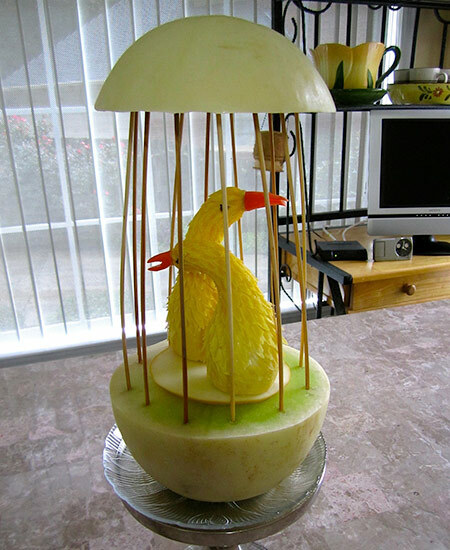 I’ve included this photo to show how you can make fruit bird so very easily. 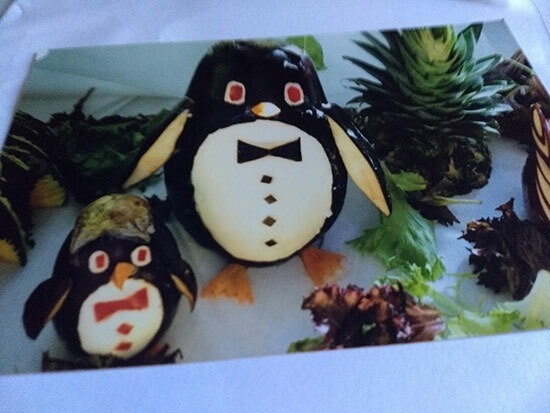 Another cute simple idea is to make Penguins from eggplant. Make sure to brush the cut areas with lemon or soak for a couple of minutes in salted ice water to delay the oxidization that can make the white areas turn brown. Rey Alaras made these. 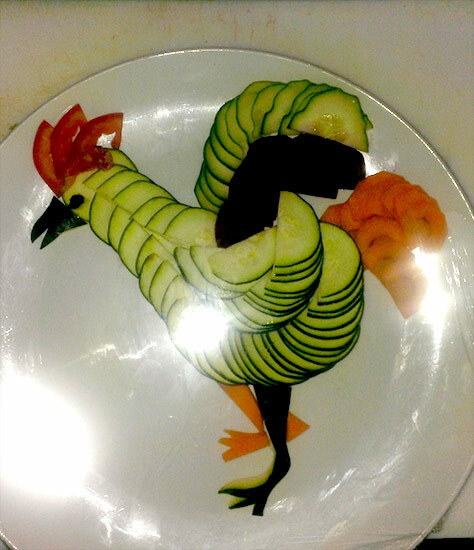 This zucchini rooster is a fun way to serve a veggie tray. Omusugu Henry create this one. 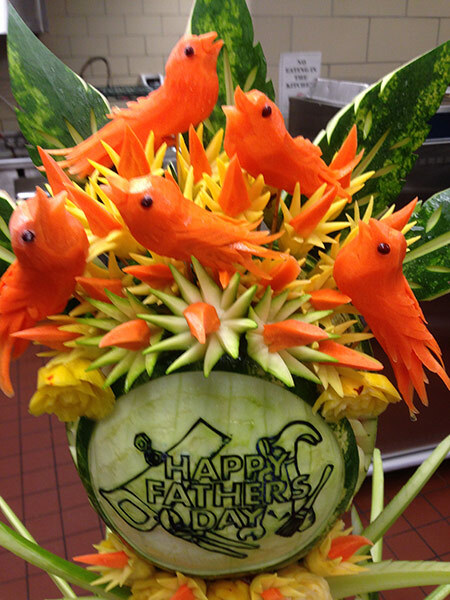 Rani Patel’s crookneck squash birds with carrot beaks are displayed within a cage made of honeydew and wooden skewers. A V-cutter tool like those we have for sale in our shop can be used to make all the fuzzy looking feathers. 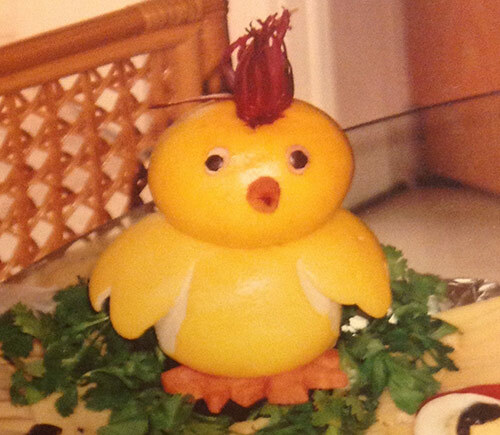 The same technique was used to make my Easter chicks. Now that you have seem a wide variety of carved vegetable birds, have fun making some of your own. 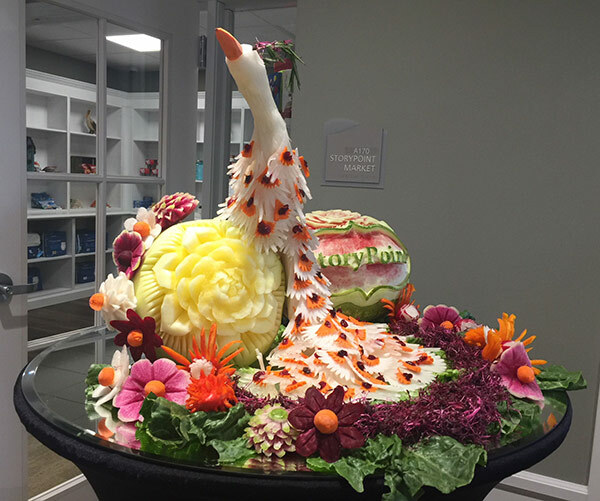 If you are looking for more bird carving ideas, take a look at our blog post about Melon Swans. 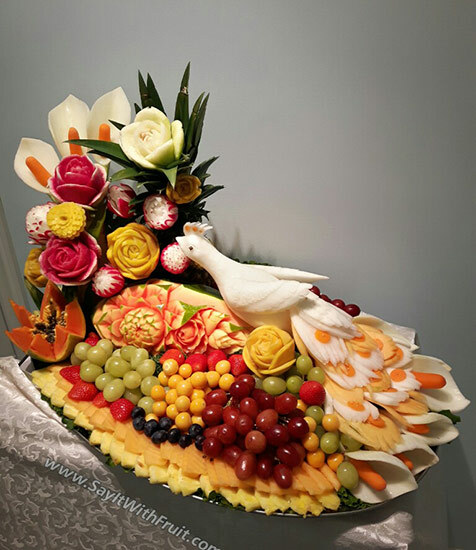 You’ll also find a variety of blog posts that feature birds carved from fruits and vegetables throughout my blog. Absolutely amazing! Looking forward when you offer the lessons so we can learn how to carve them too. We have many types of flower carving lessons. Root vegetable roses in our Hearts and Roses lessons. More than 10 types of flowers with several variations each are taught in our Vegetable and Fruit Carving 101 Course for Beginners. Smooth and zagged edged melon flowers. More types of flowers in Amazing Carving with Jimmy Zhang. Have fun exploring, and creating!